My older brother is in his mid-40’s. He works for a large software and tech firm (I’m talking large) in Seattle, Washington. He’s kind of a big deal. I am nine years his junior, and when I was a kid, I remember thinking my ‘big deal’ older brother was the cat’s pajamas. This was in the 80’s. And when he worked out, he wore lavender converse high tops, pegged his acid-washed jeans, cut off his sweatshirt to bare his midriff, and wore bandanas around his forehead-all to perfect his pubescent muscled toned arms. Do you know what he held in his hand almost always? Hand grippers. Why? It gives you “popeye arms” he’d tell me. Apparently that meant that the ladies would come swooning. As an adult, he has two adorable daughters and a Russian wife who scuba dives in glacial water. So, hand grippers worked for him. Can hand grippers work for you? Well, you better believe it. Only this time, we have much more than the analog hand-gripper technology my big brother had in the 80’s: with the rubber handles that wore off the rusting metal, and the spring that would pinch the skin on your palms. Thanks to Grip Pro Trainer hand grippers, we can hand grip in streamlined 21st century technology. These Grip Pro Trainer hand grippers are the cat’s pajamas. Just watch how various folks (old and young, male and female) work these hand grippers. 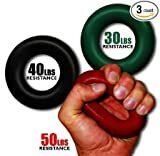 First of all, the Grip Pro Trainer hand grippers look like donuts. And who doesn’t like the shape of a donut? After you eat too many donuts, don’t worry – go and burn off the excess calories and squeeze your way back to fitness. They come in resistance weights of 30, 40, and 50 lbs and they are small enough to hold in an average sized adult hand. Which weight will you try? The Grip Pro Trainers are easy to use. Just get the donut shaped grippers in the palms of your hands and squeeze repetitively. I haven’t ever squeezed objects as part of my resistance training. So this was an awkward movement at first. I have small arms myself so I think the lowest resistance weight of 30 pounds produced the most effective movements. I know that hand grippers are a great exercise for rock climbers. So, I let my parents give these hand grippers a try. They’re in their 70’s. And my mom has a bit of arthritis in her thumb joint. My dad has the body of a farmer with a big torso. He’s a strong guy. My mom birthed 7 children. I don’t know who’s stronger of the two of them, but they are both pretty solid for oldish white folks. They gave those hand grippers a good try. My mom struggled a bit, but my dad said, “I wonder if he could keep the hand gripper?” His first thought was that I was letting him try out a prostate strengthener (I don’t know what that means?). Anyway, they gave up after a bit and decided to play a little game of “rolling the Grip Pro Trainer grippers” down the Sunday dinner table. It was pretty cute. Hand grippers to regain strength! The next person I filmed is the adorable “boy next door,” who is practically a vegetarian. One might think looking at him that he needs a little bit more meat on his bones-but no, look at the vegetarian go! He can hand-grip with the best of the 80’s meatheads. Go ahead and eat that tofu to your heart’s content! I can imagine him being able to hold his hot yoga poses for two additional minutes without breaking a sweat. He also mentioned he felt like they would be a great way to work off extra tension while he works at his desk. I tried these hand-grippers myself and I can see that regular hand gripping exercises will boost my confidence at a number of important tasks that require a strong grip. Such as scrolling through my social media feed. It’s all in the thumbs. Now I just need to mail some of these Grip Pro Trainer grippers off to my older brother and see if it takes him back to his New Wave days-inspiring him to lose his dad bod, gain some more hand and lower arm grip strength, and tone those very post-pubescent muscles. I think this is cool product. I would be interested to see what most people use the Grip Pro Trainer hand grippers for, but I live near the mountains and have always wanted to take up rock climbing. Maybe this will give me an edge. Certainly popeye arms if nothing else. NextIndestructibles baby books: How Indestructible are they? Elizabeth is a Utah native, but since living in the UK for nearly a decade--is a decided anglophile. She graduated with a BS in technical writing and is the daughter of an award-winning advertiser and the granddaughter of an award-winning photojournalist. Writing runs in her blood, but so does research. Elizabeth is pursuing a Master's degree in Clinical Mental Health Counseling--so writing in this vein is her particular passion. She is the mother of three anarchists.